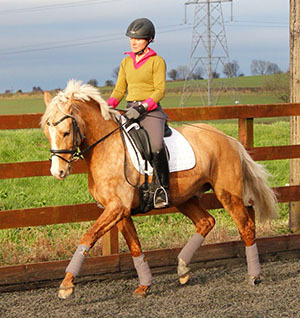 Champ of Dance combines beautiful looks, excellent paces, a lovely temperament and great trainability. 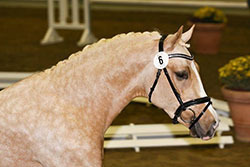 He was first licensed in Germany for breeding with the Westfalen Pony Studbook in 2013. Champ of Dance has been bred from the very best German sport pony bloodlines which themselves go back to heroes of British pony breeding, such as Jennie Loriston-Clarke’s Bubbly, Bwlch Valentino and the Downland dynasty. 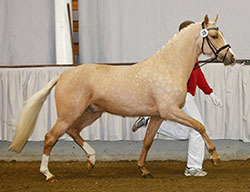 As a Palomino, he offers the possibility to pass on his cream gene to his progeny, which can result in the popular Palomino or Buckskin colour, depending on the colour of the mare. Champ of Dance is by Can Dance, who was born in 2007 and became the Champion stallion of the Rhineland pony licensing in 2009 and was then awarded Elite status for breeding with the important Weser-Ems pony studbook. Can Dance already sired several licensed stallions, five alone from his first year, and many graded mares. He is renowned for passing on his exemplary rideability. The dam of Champ of Dance is the graded mare Verb. Pr. St. Darina by Dornik B. Darina is from one of Germany’s most famous riding pony dynasties: Darina is full sister to the German licensed stallions Danilo, Danny Gold and Desmond. Danilo won the European pony dressage championship in 2010, came second the following year and won the team competition at the European Championships four times. Darina’s dam, Pamina, is half-sister to the renowned Golden Dancer, both out of the mare Golden Charm. 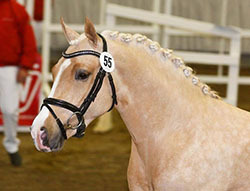 Golden Dancer founded his own breeding line and won team Gold at the European Dressage Championships. Darina is also mother to the mare Championess who won the German Championship (Bundeschampionat) for 3 year old ponies. Dornik B is four times winner at the Bundeschampionat, three times Individual Dressage Champion at the Pony European Championships, and won the team title with the German pony team at the European Championships seven times. He has sired numerous licensed stallions, many graded mares and countless numbers of ponies who have been successful with children across the sport. Champ of Dance has an exceptional temperament. 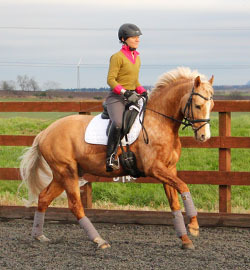 He shows great trainability in his daily work and is always eager to please his rider. So far he has been to a few competition outings up to medium level. Among those was the 2016 qualification round at Rockrose near Edinburgh where he qualified for the final of the 5 year old dressage ponies at the Hartpury Festival. Champ of Dance received strong scores at his licensing, in particular for the correctness of his body and his three excellent paces. Champ of Dance is a wonderful choice for any breeder wanting to produce beautiful ponies with international prospects and a good temperament. 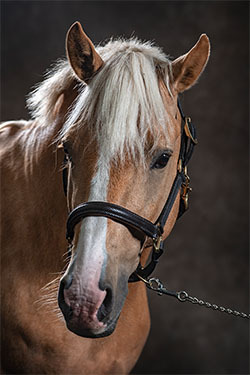 He is a very handsome pony who always turns heads, and his exceptional movements and poise combined with his willingness to learn more than confirm his consolidated pedigree. 2018 was Champ of Dance's first season at stud so his first foals are eagerly awaited in 2019.